We probably don’t think too much about types of darts in our clothing. Either they are present or not, short or long, narrow or wide. When looking at historical sewing you sometimes see darts in groups, such as at the shoulder or waist, darts in odd to a modern eye places, such as near the hip or back of the neck, darts in multiple places, like the armscye and shoulder, or darts that are really more like vertical tucks, which let the fabric ease out at the top and or bottom (this can be especially nice at the ribcage, ending at the bottom of the bust, or top of the hip). What you see in those cases are either straight line darts or those that jog in the middle, reducing the garment by a little wedge shape of fabric. But they’re straight. Usually even when they transect the back waist. There are other cases where you see a curved seam in a standard dart location, but that is usually either used to gather in fullness above or below or as a design choice. And then there are curved darts. I can’t believe I’ve only just discovered them. I guarantee that I’ve used them before, either as lazy sewing or to adjust fit, but I’ve only just realized that they can be a design intention, meant to solve a problem. Don’t laugh at me. I’m working with a pant pattern that has a long, slightly inward curving waist dart. The paint is high waisted and if the dart didn’t curve in, it wouldn’t fit the small of the back. But of course such darts can also be used for specific figures: inward curving for a flatter bum, outward curving for a rounder bum. After a healthy smattering of posts I seem to have run out of things to talk about… Or I’ve been working diligently on gift projects I can’t yet discuss. ‘Tis the season. Today I’d like to share an interesting website I just stumbled on via Pinterest. 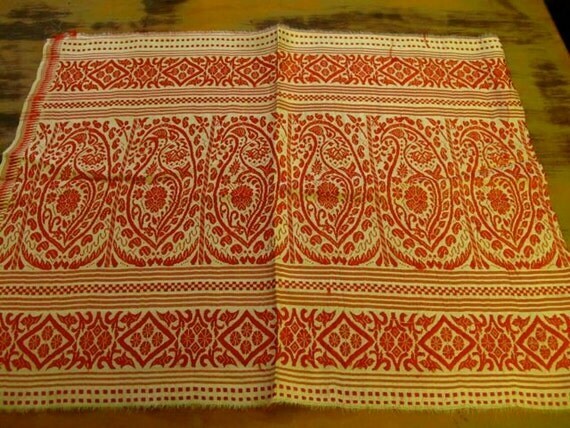 It’s called Unsung Patterns: An Archaeology of Home Sewing. The image above is from this post on, of all things, corset bags. It appears to date from the 1910s or so and features an embroidery design bag. 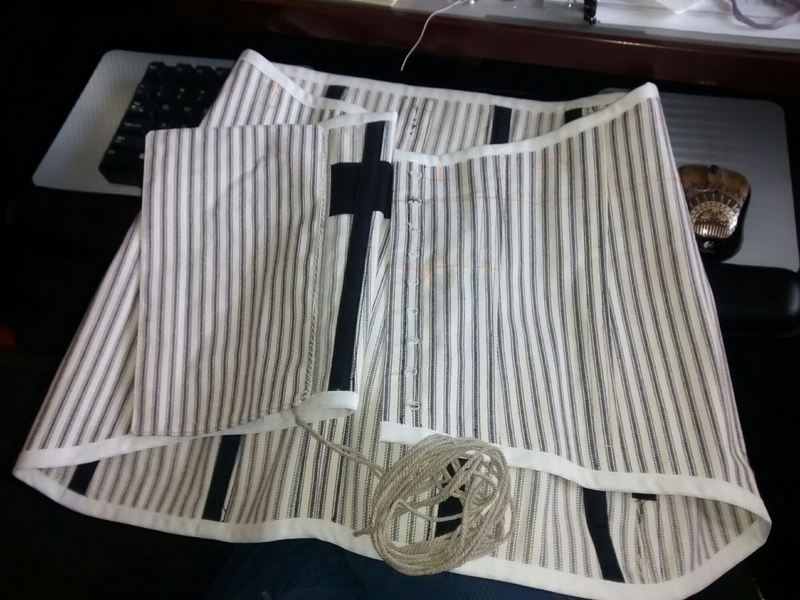 The bag itself is made from a strip of fabric 9″ x 1 1/2 yards long, folded in half and stitched on the long sides. I must say, though I store corsets and have seen modern commercial versions of bags (usually one side is clear plastic), it never occurred to me to make one. My corsets tend to live folded into large handkerchiefs. Silly me. Other entries on the blog feature some other unique items, including early 19-teens aprons, 1930s pirate costumes (not as bad as you might expect), a 1920s Martha Washington costume, some German patterns and a variety of early century work wear, all with a little history and background included. 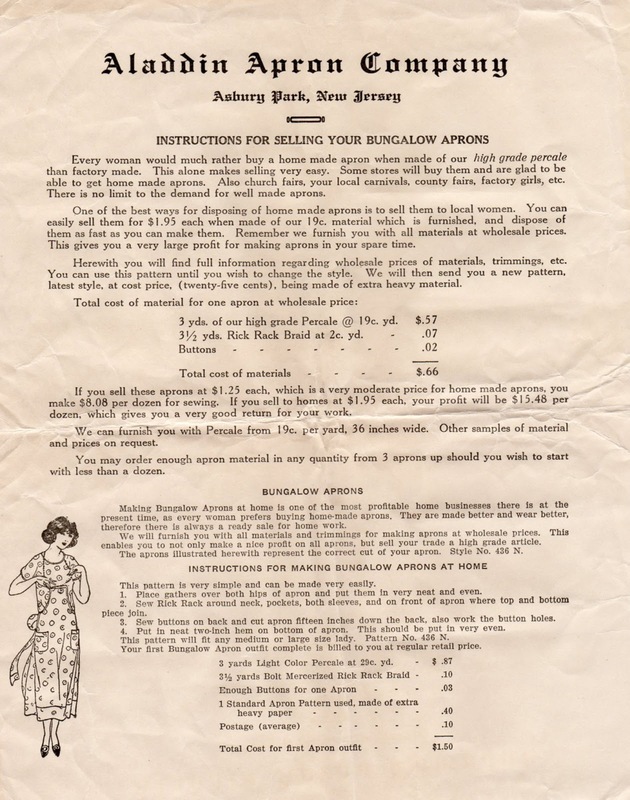 I’m rather interested in aprons right now, so this post on a 1926 “Bungalow Apron” from the New Jersey based Aladdin Apron Company (great name! ), with its musings on the possibilities of women going beyond the home sewing realm into cottage industry is particularly appealing. It’s an interesting site to peruse. Enjoy! 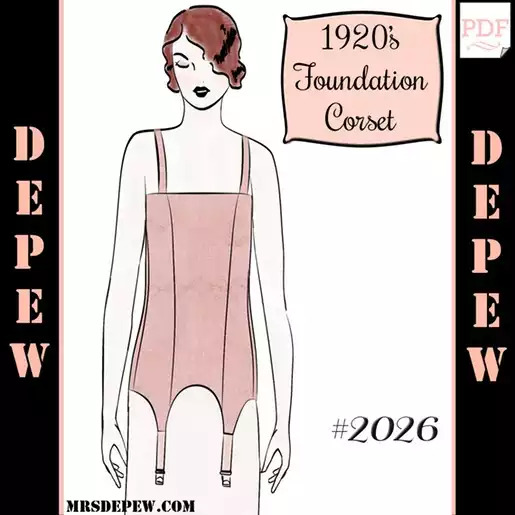 Just when I’m researching 1930s corsets and extrapolating a 30s garment from a teens one, Mrs. Depew unveils one of the intermediate eras, the 1920s Foundation Corset. It’s hard to see exactly how many seams it has, but I imagine it has four more in the back. The top line is part way between the over bust Victorian models and the shape of the 1911 corset. The bottom length and garters look to be long enough to both shape and smooth. Of course it’s slimming, or rather flattening… I’d say my 30s corset falls nicely in line. Mrs. Depew does have their own 30s pattern as well. They’ve got links to some full books of historic costume. It’s nice to see these since I’ve been finding the Internet Archive less search friendly for cosigning resources lately. I’m really excited about a Tumblr site I just discovered. It’s a great resource for Victorian, Edwardian, 1900s, 1910s and1920s original patterns. It’s called Real Historical Patterns. I’ve only scrolled through about a year and a half of the archives so far, but there are a plethora of patterns, copied from various magazines of their day. Not only are there many, many women’s patterns to browse, but I saw a decent smattering of children’s and men’s patterns, with more men’s being promised soon. Enjoy everyone! Oh yes, they take submissions, so share the knowledge and send in a scan of that natty old coat pattern you found moldering away in grandma’s attic. P.S. 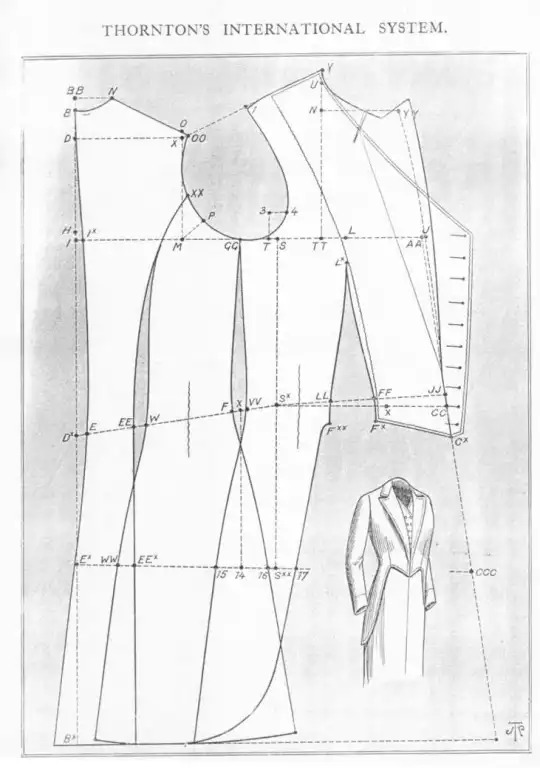 I’m making that tail coat jacket right now, rather, something very similar and slightly earlier. Photos soon. I’m happy to say that I’ve found out the date for the SLO Tweed Ride before it happens this year. It will be happening May 5, 2013 at Triangle park, 1pm. You can view the group’s blog here and their facebook page here. Unfortunately, there isn’t much detail on exactly what will be happening, but you can view their previous years’ photos to get an idea. I don’t know if the Rogues will be in attendance, but it sure does look fun! 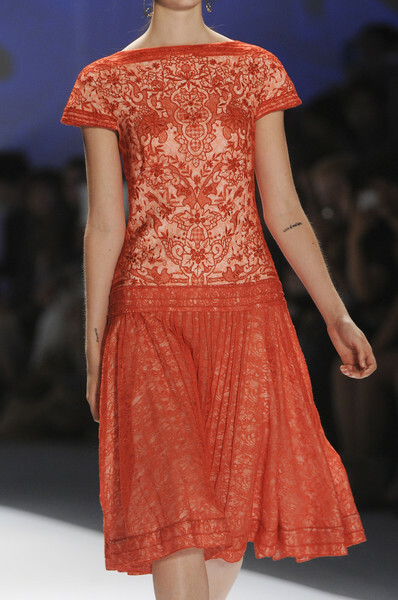 A Little Downton Influence on Runway Fashion?